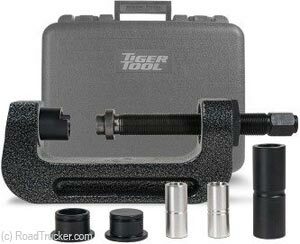 The Manual Wheel Stud Service Kit remove and install 10 studs in only 10-15 minutes. It provides fast and effective removal and installation of even the most seized wheel studs without the use of hydraulics. It also eliminates risk of damage to hubs, seals, wheel bearings, wheel studs and increased safety from accurate installations. Applicable for use on inboard hubs and removal of the hub is not required.